Rising early on the morning of January 23, volunteers of the American Society for the Defense of Tradition, Family and Property, as well as the young participants of the TFP Student Conference attended Mass, spiritually preparing for the day’s events. After Mass and a few final provisions, we began the drive to Washington D.C. Our destination: The 39th annual March for Life. We were prepared by a weekend of talks, culminating with addresses by His Imperial and Royal Highness Prince Bertrand of Orleans-Braganza and His Highness, Duke Paul von Oldenburg. In his speech, Duke Paul particularly highlighted the leading role that American Catholic counter-revolutionaries must play in the global struggle against the sin of abortion. Spurred on by these lectures, and motivated by the nobility of the pro-life cause, we were ready and willing to brave the rainy weather. As the march began, the TFP band played such favorites as Hail Holy Queen, God Bless America and the Marine’s Hymn. Complete with a full complement of instruments, including six bagpipes, the band tirelessly played song after song as thousands marched by. The statue of Our Lady of Fatima was escorted up Constitution Avenue by TFP volunteers in their ceremonial habits. The flyer was extremely well-received with thousands upon thousands being given out. Responses such as “St. Michael? That’s awesome!” and “Thanks for being here, you’re doing great work!” were commonplace. 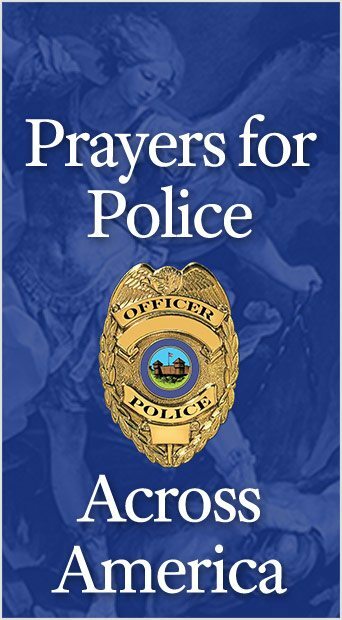 A small child, upon being shown the picture of St. Michael by his mother, exclaimed: “I love St. Michael; he’s the best!” Also popular was the offer of a free St. Michael’s chaplet of which many people planned to take advantage. Prince Bertrand and Duke Paul also honored us with their active presence at the March for Life. Once again, the march served to show that Americans oppose the sin of abortion. In opposition to the several hundred thousand pro-lifers, there were a scant handful of “pro-choice” activists (read anti-life). In spite of rain and frigid temperatures, approximately 350,000 people converged on Washington to pray and fight for the end of abortion. 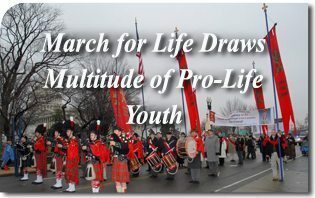 This entry was posted in In Defense of the Unborn and tagged 2012, abortion, America, Law, March for Life, Media silence, pro-life, Saint Michael, Washington by William Stover. Bookmark the permalink.